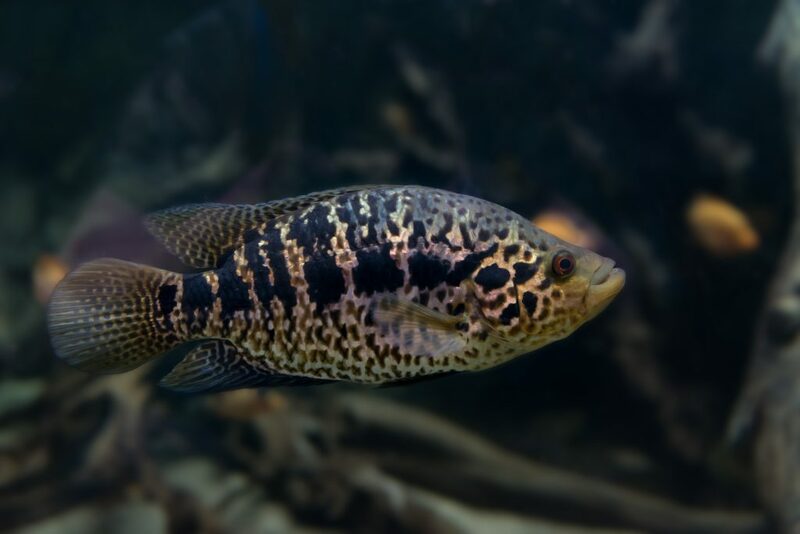 When feeding Cichlids, look for foods that meet their dietary requirements; lower protein for most African varieties and higher protein for most of the American varieties. Depending upon the size of your fish (the average adult size is between 2 and 14 inches long), you should expect to feed your fish once or twice a day and no more than what your tank’s population can completely consume within no more than two minutes. African varieties typically avoid feeding from the surface while American varieties are less fussy about food location. The demeanor of Cichlids can vary but for the most part they can be highly territorial. This means that you should strive to keep your tank filled with similarly sized fish to avoid any scenario where bigger Cichlids eat the smaller ones. Offer lots of rocks or wood to create hiding places and change the layout of the tank regularly should you encounter some territorial tendencies. Good signs of health in this type of species include bright colors, clear eyes, full and active fins, and healthy appetites. You want to avoid overcrowded conditions as this can lead to major stress, stress-induced disease and water quality issues. Other red flags include fungus, elevated scales, erratic swimming or rapid/consistent loss of color or appetite. Be sure to use well water or properly treated tap water. Always monitor the pH to be sure it is within the parameters of the fish you keep. Remember, to maintain proper water balance with these fish, conduct regular water changes (20-25% of the water volume no less than once every other week) and use filtration that is slightly more than you would normally use for a straight tropical tank due to their voracious appetite. For the ideal Cichlid tank, you should expect to check your filter operation and media condition along with the water temperature every day. Each week, perform water quality tests to be sure nothing out of the ordinary is underway. Always look for any change in behavior daily and be sure to avoid adding any new fish without quarantining them first. If you find your cichlids are breeding regularly, assuming you have the right mix, congratulations, your habitat is to their liking. At Hikari®, we make several Cichlid-specific products to help your fish look and feel their best. Scope out the options we offer to help your Cichlids reach their natural splendor.